Fall brings with it hot cider, chilly nights, and shorter days which can mean higher energy costs not just in heating your home but also in keeping it lit. 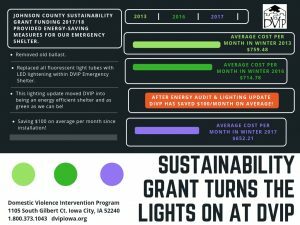 This year the Domestic Violence Intervention Program (DVIP) is able to keep the lights on for less money than they have in the past 5 years. 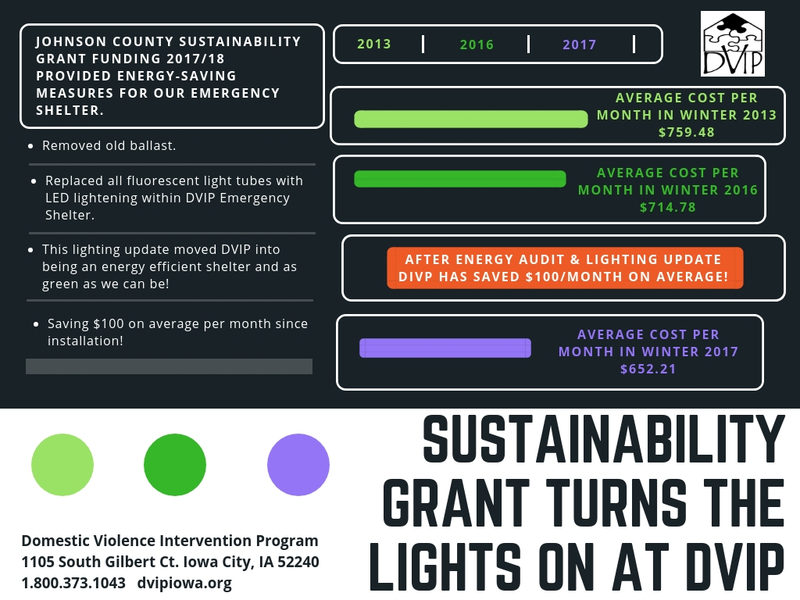 This past October as one of the recipients of the Johnson County Sustainability Grant for FY 2017/18 DVIP has been able to make improvements to their emergency shelter in order to increase efficiency and become as green as possible. With this generous funding, all new lighting was installed throughout the multi-story emergency shelter by removing ballast and replacing old fluorescent tube lights with new LED lights in the youth activity room, administrative offices, and client bedrooms. While the replacement of nearly 204 lights has brought more energy efficiency and higher quality lighting to the emergency shelter it has also saved the organization nearly $100 a month in energy fees which can, in turn, be used to house another family in need of their crisis intervention services. This work would not be possible without the support of the Johnson County Board of Supervisors and is greatly appreciated by the clients, staff, and volunteers at DVIP.